Creating an API that exposes data doesn’t have to be complicated. 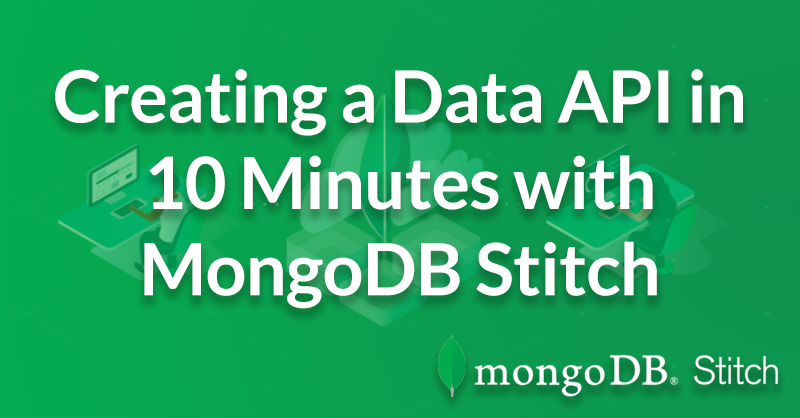 With MongoDB Stitch, you can create a data enabled endpoint in about 10 minutes or less. At the heart of the entire process is MongoDB Stitch’s Services. There are several from which to choose and to create a data enabled endpoint, you’ll choose the HTTP Service with a Webhook. 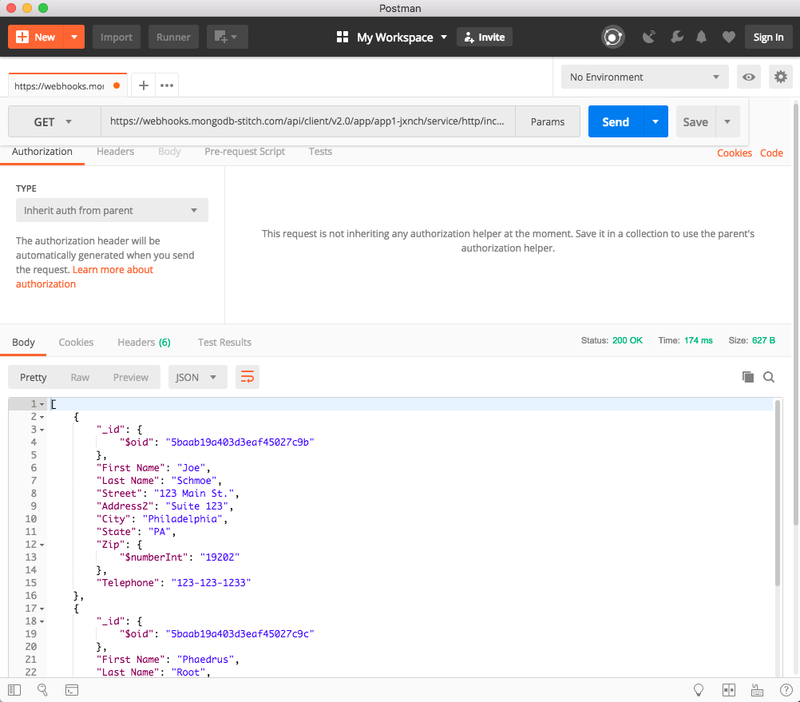 When you create an HTTP Service, you’re enabling access to this service from Stitch’s serverless functions in the form of an object called context.services. More on that later when we create a serverless function attached to this service. Name and add the service and you’ll then get to create an “Incoming Webhook”. This is the process that will be contacted when your clients request data of your API. We’ll create this API to respond with results to GET requests. Next up, you’ll get to create the logic in a function that will be executed whenever your API is contacted with a GET request. Before we modify this script to return data, let’s take a look at the Settings tab — this is where you’ll find the URL where your clients will reach your API. That’s it — you’ve configured your API. It’s not going to do anything interesting. In fact, the default responds to requests with “Hello World”. Let’s add some data. This exposes all documents in the database whenever a client calls the webhook URL associated with our HTTP Service. That’s it. Let’s use Postman to show how this works. Grab your API Endpoint URL from the service settings screen. Mine is as follows — yours will differ. Check out the GitHub Repository to review the code and try it yourself and review the screencast where I create a data enabled API in 10 Minutes with MongoDB Stitch. Want to try this for yourself? 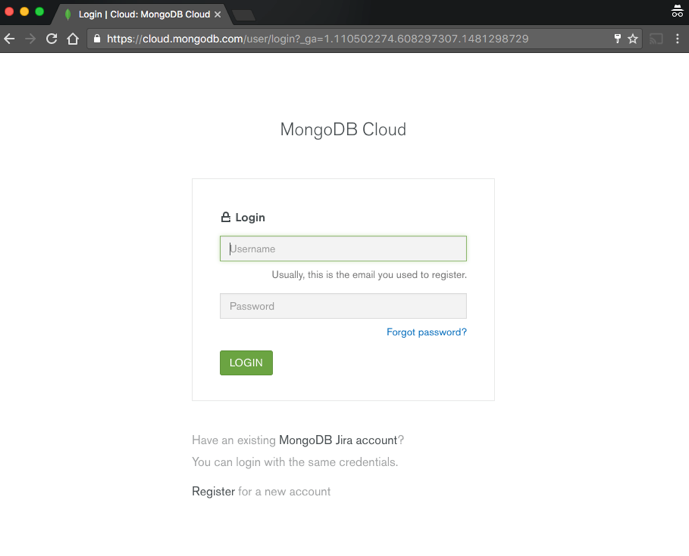 Sign up for a free MongoDB Atlas account. 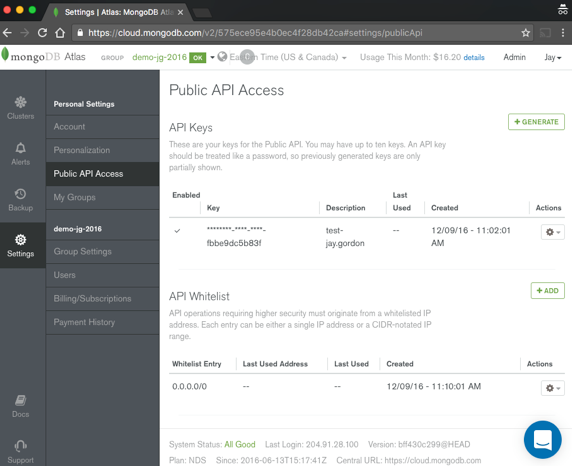 Looking to leverage an API for integration with MongoDB? Read Andrew Morgan’s article on Building a REST API with MongoDB Stitch. Last week we showed you how to list the resources associated with your MongoDB Atlas environment via a simple Python program. Let’s extend this program this week with a more useful feature, the ability to pause and resume clusters. We can use the Atlas Management API to do this via the “Pause Cluster” menu entry. However, when we pause a cluster the Atlas environment will restart the cluster after seven days. Also, both pausing and resuming require a login, navigation etc. Basically, it’s a drag to do this regularly. If you are running clusters for development they are rarely required late at night or at weekends. It would be great to have a simple script to pause and resume these clusters using the project ID and cluster name. Then we could run this script in crontab or our own favorite scheduling program and pause and resume clusters on a defined schedule. We have rewritten the py-atlas-list.py script to do exactly that. The extended py-atlas-list.py script allows you to both list resources and pause and/or resume clusters using their project ID and cluster name. (We have hidden the real resource IDs behind X’s). To get the project ID look for the id field for the Proj entry. To get the cluster name just look for the string in quotes after the cluster identifier. We have highlighted the project ID and the cluster name we are going to use. To resume a cluster just use the --resume argument instead of the --pause argument. Want to pause or resume more than one cluster in a single project? You can, just by adding multiple --pause or --resume arguments. Now, you just need to add this script to your favourite scheduler. Note for this example I have already set the environment variables ATLAS_USERNAME and ATLAS_APIKEY so we don’t need to pass them in on the command line. Now go save some money on your development clusters. Your boss will thank you! MongoDB Atlas has a full featured API which allows our users to programmatically create, modify and delete their clusters. We'll go over some basics on how to do this using curl in our bash shell. The goal of this post is to show you how to configure API access and use the basic features available. Basic understanding of how to utilize APIs. Now navigate to the "Settings" section on the left menu. You'll see under "Personal Settings" a section for "Public API Access", click this and you'll then be presented with options to create an API key and then set a whitelist of IP addresses you are able to access the API from with your authenticated key. First, we will generate an API key. Click the +GENERATE button at the top of the section next to "API Keys" and provide a description. 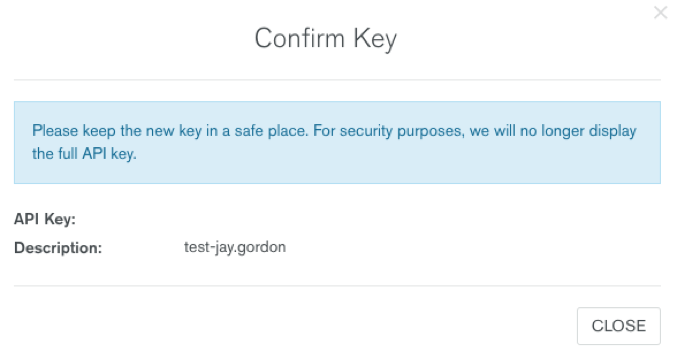 I will use "test-jay.gordon" but there's no specific information required; this is for your own labeling. Once the key is generated you'll receive a box as above with the key provided. Save this, it will not be repeated for you again. If you are using git, do not check this into to a public repository for security reasons. In this situation, I'll just want to allow "ALL" (0.0.0.0/0) since I am using this temporarily, however if you have a specific subnet of servers that you expect to invoke these functions from, you'll want to whitelist these particular IPs. Click the ADD+ button next to the API Whitelist section and enter any IP you would like to whitelist with the appropriate CIDR annotation. You can do this multiple times for multiple ranges or IP addresses. All other editable fields are optional. 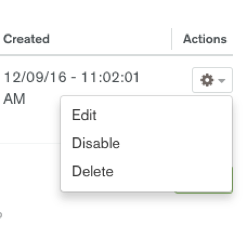 If you do not specify an optional field, MongoDB Atlas uses the field’s current default value. 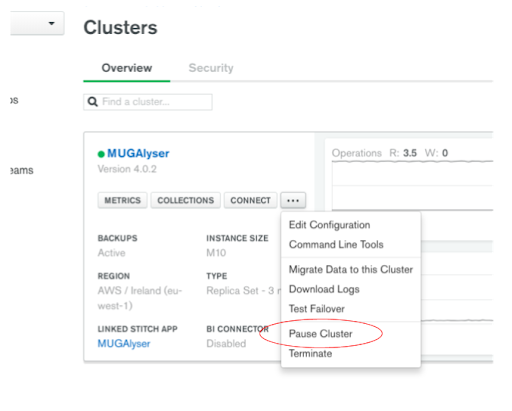 To view the current default values used for new clusters: open the Atlas interface; click the button to add a cluster; view the default selections; close the window without saving changes. As you can see I have placed the required values for the cluster's name, replication factor, shard total, name of our hosting provider, the region within AWS, the instance size, the disk size, the total amount of IOPS and backups enabled. I saved the file as "json_out.txt" for myself, but you can call it whatever you like. Now let's build our curl statement and execute it. We require two more bits of information to finalize this. The string above is an example of my group, so be sure to get yours! Now we can build our curl and get our cluster built. Feel free to type this in a editor or just in the bash shell.I prefer to do so in vim so I can save it and modify if I make a mistake. --data @json_out.txt: the JSON file containing the requirements for how our cluster will be built. We're ready to execute the command, let's build our MongoDB Atlas M30 cluster named DataStore with 40 GB of disk, backups enabled, IOPS of 120 and 3 replicas in total. curl -i -u "jay.gordon:$APIKEY" --digest "[https://cloud.m575ece95e4b0ec4f28db42ca/clusters](https://cloud.m575ece95e4b0ec4f28db42ca/clusters)"
You are not limited to just creating and deleting your cluster. You can use the API to modify other aspects such as the disk size or users while a cluster has already been created. 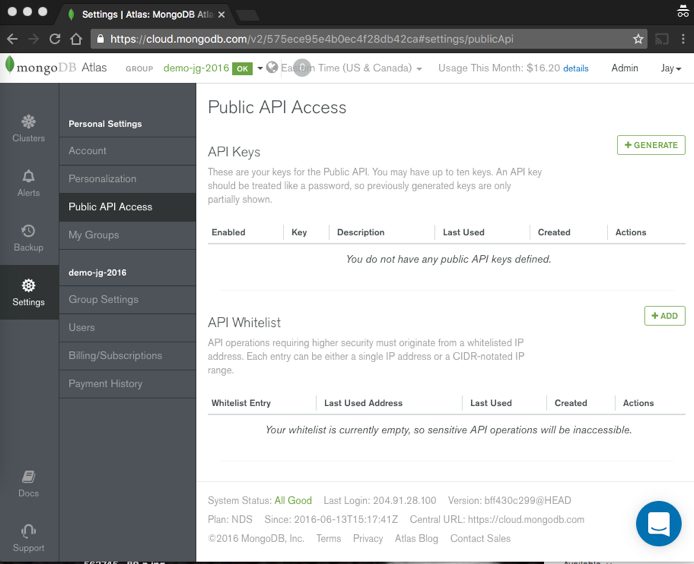 You can review all of our API resources by going to the MongoDB Atlas API Documentation. Want even more MongoDB Atlas information? Check out M034 at MongoDB University for videos on how to use Atlas and start spinning up new MongoDB Clusters!